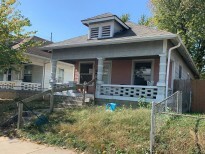 Great 2 bedroom on the near east side of Indianapolis. Sit on your front porch and enjoy the mature trees throughout this established area. Home is nearby new rapid transit line going in on Washington street. Come check this one out today.